Beauty subscription boxes make an excellent Christmas gift and they don’t have to cost a lot! 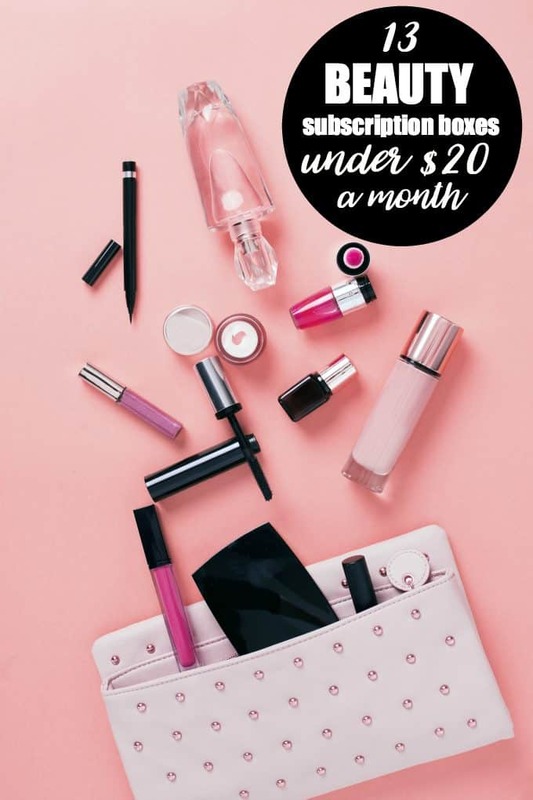 In fact, you can find a few $10 and under a month and even more $20 and under. I’ve rounded up my top picks for beauty subscription boxes under $20 a month. Buy one as a treat for yourself or give to someone special as a gift! 1. Lip Monthly. 2-3 full sized products and 2-3 sample products. 2. Beauty Box Five. Five beauty samples. 3. Vegan Cuts Beauty Box. 4 to 7 luxury beauty products. 4. LIPP. 3 individually packaged sample pods of our LIPPstick colors, hand selected by beauty experts to match your unique hair, eye and skin color. 5. NailDrama. A specially curated box of 5-6 themed nail art supplies arrive each month to spark your creativity. (USA only). 6. NailDash Kit. 1-2 Nail polishes, and 3-5 other nail related items such as accessories, tools, and nail care products! 7. Beauty Joy. Receive one hand-curated Jewelry Item, one Full Size Beauty Item, and 2-3 Deluxe samples every month. 8. Mask Maven. 9-11 masks each month. 9. Benevolent Beauty Box. 100% cruelty free beauty products. 10. EVE LASHES & Co. False eyelashes delivered monthly. 11. Monthly Bath Box. Fun things to use in the bath. (USA only). 12. Best Face Forward Masks. 5 face masks plus a special bonus mask. 13. Beautifly Pure LLC. 4-5 full size and/or sample size freshly handcrafted bath and beauty products. (USA only). Which beauty box is your favourite? This is actually a great christmas gift for the girls that love make up and skin care products, my daughter being one. Some great picks, one of these might be a good gift idea for my sister.